Army Master Sgt. 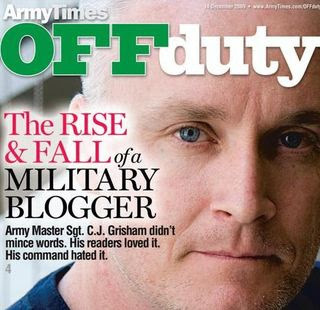 C. J. Grisham has always led from the front, from combat that earned him the Bronze Star with V device, to doing right by the men he led. His honesty won him readership and respect, from the White House on down. Yet, when he stood up for his children in school, his command did not stand by him. You can read more at Military Times to get the full story. Please write "Grisham Legal Fund" in the memo line if you use this option. Milblogs have been a vital link in getting accurate news and information about the military, and military operations, to you. Today, many milblogs are gone and others are under attack from within and without. Today, you have the chance to imagine a world without milblogs, and to do something about it. Make your voice heard by writing your congressional representatives and others, and by making donations as you see fit. The battle for freedom of speech and the marketplace of ideas is fought on many fronts and in many ways. Without your help, the battle may well be lost. WIN FREE MILITARY BOOTS FOR LIFE!